One of the best ways to start learning about herbs is to grow them. You just have to get your hands dirty. A window box is a wonderful way to begin the introduction to plants that will last a lifetime. When you grow an herb, you get an opportunity to live and learn from it. You watch the seedling emerge through the soil, watch the plant expand with new growth, smell the flowers as they bloom and rest with the plant during the colder months. You get to know the herb in a way that connects you to the rhythms and cycles of the earth and the individual plant. Experiencing living herbs best connects us to the energy and vitality that the plants offer. Of course the pleasurable side-effect of growing a window box herb garden is that you get to have the green goodness of the plants close at hand for adding a pinch of this to recipes, a snipping of that for tea, and a whiff of all of them for inspiration. The “Fun with Herbs” class that I teach begins in the early and cold days of March, so the first class is always dedicated to planting an indoor window box. It’s always a crowd pleaser and many students have commented that the overwhelming herbal aromas, scent of the soil, and textures of the young plants are just the right blast of green to kick start the spring season. In class, we focus on only a few plants at a time rather than a multitude. Like a good friend, it takes a while to get to know each one so we take a fewer but more exhaustive approach to learning. For each herb that we plant, I’ve created a brief data sheet that discusses some of the folklore, identification, cultivation, harvest methods, and uses (including recipes). You can click on the plant links below to download the pdf of each. There is also a planting resource data sheet that includes planting zones, a list of mail order seed & plant companies as well as and some local (to southern NH) nurseries and garden centers that I’ve found to be reputable. The first plant we get to know is basil, a symbol of love and good wishes. Basil, a tender annual, is one of those plants whose fragrance calls to you with seductive allure. Ah, Basil, the king of herbs. Next we get an introduction to thyme, a symbol of courage, vigor and strength. This tender perennial is a standard in kitchens all over the world where many a cook has said “when it doubt use thyme”. The third herb we meet is rosemary, a symbol of love and remembrance. Rosemary is a tender woody perennial whose pine-like needles add a distinctive scent or flavor to many herbal combinations. Rosemary holds a special place in my heart and I have placed a sprig of it with both my grandmother and father when they left this world, to express my love and unending memory of them in my life. So, dig in and plant your own window box herb garden. You may find some great friendships with plants that you didn’t expect but that you’re sure to appreciate. Field hockey in New England. I love it. In high school it was my game. As a four-year letterman, I ruled the defensive field with authority, skill, and a sure-footed confidence. That's me in the photo to the left (circa 1980 - 1981). My teammates admired my leadership and elected me one of their co-captains. My coaches rewarded my speed, agility, and defensive tenaciousness with countless ‘defensive player of the game’ awards. I even earned a place on the Eagle Tribune's Field Hockey All-Star roster. I loved the running, the flicking, rushing the opposition on corners and tackling rivals as they advanced down the field. When I started looking for an adult league last year to get back into the game, it took a while to find one. After all, field hockey isn’t like boys basketball or baseball - there aren’t a lot of adult women players out there who are able to play. Life has a tendency of getting in the way with kids schedules, career paths, pets, husbands, and the ongoing responsibilities of running a household. But this spring I was fortunate to come across not one, but two adult leagues. I was in heaven. I thought there would be nothing like a game of field hockey in New England to get me back in shape. The first league was an indoor co-ed league at Seacoast United in Hampton, NH where they schedule multiple six-week sessions throughout the year. The spring session was scheduled on a slightly shorter-than-regulation artificial field with ‘push play’ only rules and a reduced number of players – 3 offensive, 3 defensive, no goalie. A great way to get back in the swing I thought. It started on the first Monday evening of May. 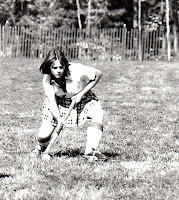 The second league was a newly-formed outdoor club in Georgetown Massachusetts, called the Northshore Field Hockey League. This was an outdoor field hockey league on real turf with regular size fields. “Wow”, I thought, “this is great stuff”. Sticks and chicks and all things field hockey. Now I was really getting excited by the thought of getting back into the game that I truly enjoyed by participating on two different teams. Life was good. Everything was set to go. I purchased a new stick, some practice balls, shin guards, a pair of New Balance shoes and molded my mouthgard to fit. I was ready to play. The first fifteen minutes of the first game were glorious. Granted I was completely winded, and missed a few plays, but I felt the same rush of adrenaline I did as a player at Londonderry High School . I was back. That is, I was back right up until I planted my foot to shift direction and tackle the oncoming offensive player and my knee missed the play. “Crunch, rip”. Damn. I had made one critical miscalculation. You see, I thought that field hockey would be a great game to play to get back in shape. But as it turns out, I needed to already be in better shape to play field hockey. Emergency room, crutches, rehab, referral to an Orthopedic surgeon, and a noisy MRI. Sigh. It looks like a torn Meniscus and a partially torn Anterior Cruciate Ligament (ACL), and that most likely means surgery. Even though I’m sidelined after just beginning, I’m optimistic that I may be able to get back to the game after I heal. I still love the rush I get playing field hockey, and hope that I can experience the thrill of the game again. Until then I'll have to live with the fact that this time around, it was at the very least, a most frustrating encounter with ‘sticks, chicks and crutches’. For a while now, I’ve wanted to share some of the content from my Herb Classes with readers, but couldn’t figure out know how to publish or link to the plant related handout sheets that I had created. Google’s Blogger, which is where my Blog now resides, allows me to link to other places and add photos, but doesn’t allow me to store data so readers can download. It took me a while to figure out that there are a number of free file hosting sites available that will allow me to store my documents online for absolutely nothing. Zilch, Nada, Gatz. And free is always a good thing to a small-time, beginner blogger like me. A Google search will give you a fuller list, but here are a few names of potential places to store your stuff online. I’ve chosen to use Mediafire. A lot of the free applications are fairly similar in function but Mediafire was noticed by PC Magazine, Cnet, PC World and Lifehacker which put it in the winners circle for me. It’s super easy to use, takes very little time to set up an account (which is optional), and within minutes I had successfully uploaded a file. Once the files are stored online, I’m able include a link to them from my blog. Readers can then download the files for their own information or use. Very cool. I really wouldn’t have figured this out if not for a friend of mine, David Seah, who’s an avid and well respected blogger in his own right. Dave is quite a bit more skilled with the online and technical worlds than I am so when he suggested I use an online file hosting package for file sharing, I paid attention. On his blog, Dave writes about productivity and other methods of empowering ourselves. Check him out - he’s one of the smartest people I know and fantastic at combining technical and creative concepts in ways that most of us can only imagine. Now that I have a file hosting application in place I’ll be adding more content from my herb classes for anyone interested in learning a bit more about the plants.